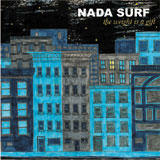 Nada Surf released The Weight is a Gift last month and it has been in my rotation ever since. I guess I bring this up because the video for Always Love will be featured on The Collective later this month and I am really excited. This album is full of "pop" tracks and complemints Let's Go very well. You can purchase the album from Barsuk here.